Primroses (Primula spp.) are one of the quintessential signs of spring. They start flowering while most other plants are just waking up from winter dormancy and come in an astonishing array of colors. 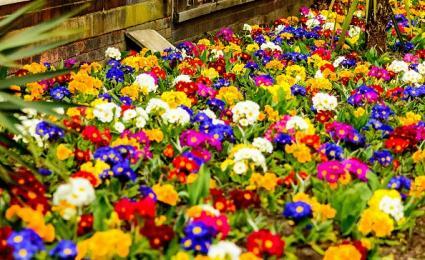 The vast majority of primroses used in gardening and landscaping are hybrids and are often labeled Primula x polyantha or are just sold by the name of the cultivar. English primrose refers to Primula vulgaris, which is one of the main parents in the line of polyantha hybrids. 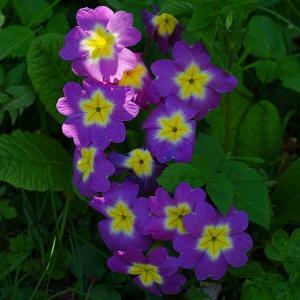 However, English primrose also serves as a generic name for many, though not all, of the hybrids. Although it shares a similar common name, the evening primrose (Oenothera) used in making oil is an unrelated species. These are small plants growing no more than 12 inches tall and wide with three-inch oval-shaped leaves that form a tidy clump low to the ground. Their flowers are about one to two inches in diameter and often have an eye in the center that is a different color than the petals. There are a couple of other primroses of interest to gardeners with slightly different physical characteristics, but all share similar growing requirements. Primroses grow best in partial shade though in cool climates some can take full sun. Though they are perennial plants, they grow so poorly in the heat of summer that many gardeners treat them as spring annuals. They need well-drained, moist, fertile soil to mimic the woodland habitats where they originate. A soil with lots of organic matter will help with moisture retention as well as improving drainage and contributing nutrients. Primroses do well in a woodland setting, with spring bulbs, in a rock garden, or next to a stream or pond. They are also lovely in containers where they can brighten a deck or window box early in the growing season. Mass them in annual beds or use them in the foreground of a perennial border with taller species growing behind them. Remove flower heads after the spring blooming period and water primroses frequently in the summer months, taking care not to let them dry out. Mulch around plants with leaves, compost or wood chips. Primroses do not require division as frequently as many other perennials, but they can be divided every few years as a method to produce additional plants. 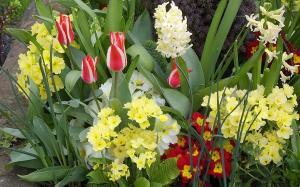 Monitor primrose plants for pests and disease regularly as they are susceptible to a number of different problems. Slug and snail damage can quickly get out of hand on primrose; set out slug bait or use copper strips around beds if needed. Spider mites and aphids typically affect stressed plants; treat with a neem oil spray mixed with a bit of insecticidal soap. Crown and root rot can be prevented by adequate drainage. Avoid fungal infection by not splashing the leaves with water; try using a soaker hose instead of a sprinkler. Viral diseases can be identified by stunted growth, mottled leafs and deformed foliage; remove and discard affected plants. The hybrid primroses are hardy in USDA zones 3 to 8 and are extremely common in garden centers, especially in early spring. 'Guinevere' has light pink flowers and purplish foliage. 'Jack in the Green' has pale yellow, greenish flowers. 'Wanda' has dark purple blooms with yellow centers. These are other primroses to try though they may be more difficult to find in nurseries. Japanese primrose (Primula japonica) is a bit taller than the others with flowers rising on stalks up to 24 inches tall in a wide variety of colors. T's Flowers is a source for buying these online that are suited to USDA zones 3 to 8. Drumstick primrose (Primula denticulata) bears compact balls of purple, white or pink flowers atop stalks up to 12 inches tall. Sheffield's is an online source for the seeds that grow well in USDA zones 4 to 7. 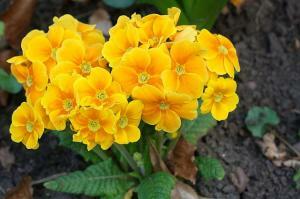 Primrose is an easy plant to spruce up the yard with as soon as winter begins to fade away. Their shade tolerance even makes them suitable for use in live indoor arrangements.